Tough day for the organization’s teams in their playoff games. Lakewood posted the only win. Alberto Tirado reverted back to his old self a little but limited the damage to a single run. The BlueClaws mounted a 12-hit attack to beat Hagerstown at home. Lehigh and Reading both lost behind pretty decent pitching from Ben Lively and Mark Leiter. Lehigh was shut out, and Reading was held to two runs. And, the GCL Phillies lost the deciding game of the GCL championship series. kyle Young provided another outstanding start for the organization today. 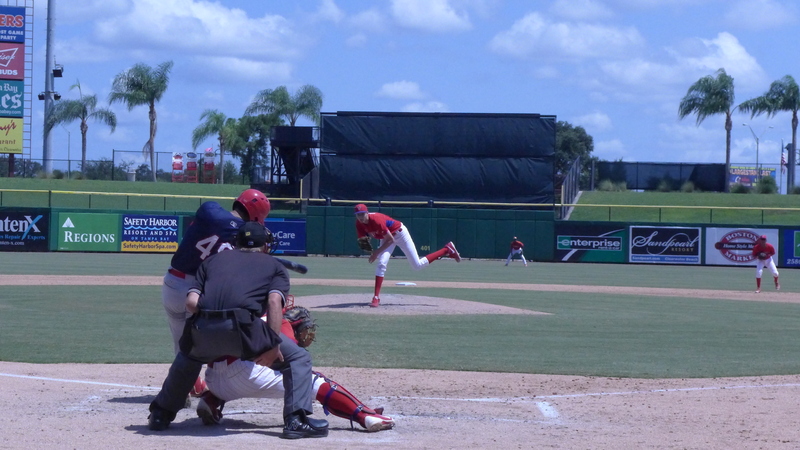 GCL Phillies (43-15, 2-2) lost 4-2 and dropped the series to the GCL Cardinals, two games to one. Kyle Young got the start and pitched a season-high 5.0 innings. He pitched well, keeping his fastball down and yielding a lot of soft contact. His FB was 87-90 mph with downward movement. He shattered a bat and struck out four. He gave up his only run in the fourth on back-to-back walks with two out and a ground single up the middle. Young finished strong picking up his second strike out to end the fourth and notching two more in the fifth inning. His line – 5.0 IP, 2 H, 1 R, 1 ER, 2 BB, 4 K, 1 WP. He left with a 2-1 lead. Luis Carrasco entered in the sixth and immediately started in a hole when he hit the first batter. Things deteriorated as he threw a wild pitch and a single that put runners on the corners. The tying run scored on a force out at second. A walk moved the go-ahead run into scoring position. Another walk set the stage for the final implosion. The next batter grounded back to Carrasco who turned and threw to Cole Stobbe to start an inning-ending double play. Either the play was slow in developing or the runner on first got a real good jump, because his Utley-like slide took out Stobbe and his throw was wild to first. Run scored and a stolen base and single added an insurance run. Jordan Kurokawa pitched two clean innings. Tyler Frohwirth pitched a hitless ninth. The Phillies opened the scoring with 2 runs in the first inning. Daniel Brito singled on the first pitch of the inning. Josh Stephen singled on the second pitch, and Danny Zardon singled on the third. Three pitches in and the Phillies had a 2-0 lead. The Phillies out hit the Cardinals 7-4, but only collected four hits after the first inning, one hit over the final 3.2 innings. Cole Stobbe had a tough afternoon, striking out all four at bats. Jhailyn Ortiz showed off some range in right. He mad a catch in foul territory running up against the right field bleachers, and made another catch going back and to his right in the gap. I’m not going to claim he’s an all star right fielder, but he’s a whole lot better than a lot of people gave him credit for based in his weight and size when he was signed. One more little anecdote before closing out the GCL’s fine season. Coach Mercado went out to talk to Kyle Young during the fourth inning. When he got to the mound, he gently pushed Young back onto the downward slope behind the rubber. He wanted to be able to look Young in the eyes while he talked to him. Oh, one more. I asked Ray Robles why Sixto Sanchez wasn’t in uniform today. Ray said, there was no way he would pitch. The GCL is a development league above all else. Josh Stephen at the ready. Young from above the dugout. Young from behind home plate. Lehigh Valley (85-58, 0-1) lost 2-0 and wasted a strong effort by Ben Lively. They will play game two against Scranton at home on Thursday. Ben Lively pitched a gem until he issued a two-out walk in the eighth. The tie was broken when the next batter homered. Luis Garcia, Alvis Araujo, and Dalier Hinojosa combined to get the remaining four outs. The IronPigs collected 4 hits and drew 4 walks, but only batted twice with RISP. Andrew Knapp, J.P. Crawford, and Nick Williams went a collective 0-10 with one walk (Crawford). Williams struck out 3 times. Reading (89-52, 0-1) dropped the first game in their best-of-five series to Trenton, 3-2. The series continues Thursday in Trenton. Mark Leiter pitched a pretty solid game. He held the Thunder to 3 runs (2 ER) on five hits and two walks in seven innings. He struck out ten batters (nine swinging). Leiter gave up 4 XBH (a triple and double that led to a run in the second, and two doubles that led to a run in the fourth). Leiter took a tie game into the seventh. He started the inning K, BB, K. Then things went to crap. A wild pitch let the runner take second, a throwing error by Alafaro gave him third. Another wild pitch brought home the go-ahead run for the Thunder. Leiter’s line – 7.0 IP, 5 H, 3 R, 2 ER, 2 BB, 10K, 1 HBP, 2 WP. The Phils outhit the Thunder 8-5, but only managed one XBH. 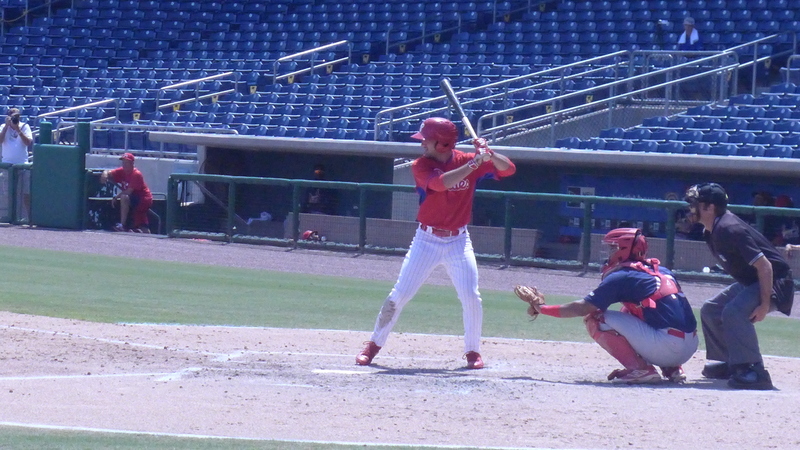 Dylan Cozens had 2 hits and an RBI. Jorge Alfaro had one hit and an RBI. Christian Marrero had 2 hits. Roman Quinn had a hit, stolen base (1), and scored both runs. Rhys Hoskins (0-3, BB) and Scott Kingery (0-4) went hitless. The Phils struck out 13 times. Kingery whiffed 3 times, Alfaro, Jake Fox, and Harold Martinez twice each. Mitch Walding entered as a pinch runner and stole a base. The Phils scored single runs in the third and fifth in response to the Thunder’s scoring in the bottom of the second and fourth. Alfaro had an RBI single, Cozens had an RBI double. Lakewood (74-65, 1-0) opened their playoff series with a 6-1 victory over Hagerstown. Game #2 will be held on Friday in Hagerstown. Alberto Tirado started and after striking out the first batter, issued a walk, wild pitch, hit batter, RBI-single. He completed the inning with two more strike outs. He issued two more walks in the second inning, but no more runs. Tirado retired the Suns in order in the third, and gave up two harmless singles in the fourth. He was lifted after four innings having thrown 81 pitches, 48 strikes. He finished with 4.0 IP, 3 H, 1 R, 1 ER, 3 BB, 5 K.
Grant Dyer followed with three, one-hit innings. He struck out three and walked one. Zach Morris and Sutter McLoughlin closed out the Suns with a perfect inning each, striking out two batters apiece. The BlueClaws mounted a 12-hit attack. Every starter had at least one hit except “C” Randolph. Emmanuel Marrero had 3 hits and 2 RBI. Deivi Grullon had 2 hits and an RBI. Jose Pujols had 2 hits. Damek Tomscha had 2 RBI. Lakewood tied and took the lead 3-1 in the fifth inning. They tacked on 1 run in the sixth, and 2 in the seventh. They went 5-16 with RISP. Lakewood added OF Jesus Alastre for added depth before the game and assigned Harold Arauz to Williamsport to make room. Arauz wasn’t scheduled to pitch anyway, and his road woes have been documented in comments on our site. He can easily swap assignments with another pitcher for the next series. 9/7 – RF Jesus Alastre assigned to Lakewood from Williamsport. 9/7 – Harold Arauz assigned to Williamsport from Lakewood. On the plus side, Brito had a very good series hitting .438. Zardon and Ortiz also had solid series with the bat. It’s great to hear Ortiz is pretty good with the leather. I remember Cozens first year, everyone thought he’d end up at 1st base (me included) and he’s still a decent OF’er. In LHV, Stassi, Valentin and Perkins getting all the hits is interesting. Three guys I feel could make some contribution to a major league team and they come through. The stars (Crawford, Williams and Knapp) go 0 – 10 with 5 Ks. Cozens has had 2 hits each in his last 2 games. He could be ready to do some damage. LKW continues it’s dominance. I think that’s 19 wins in their last 21 games. Pitching was solid and hitting continues to impress. Every member contributed something. It was a team win. Actually pitching throughout the organization was pretty darn good. I always look forward to BOTH of your recaps of the day. You both do an excellent job. Thank you both for your contributions. 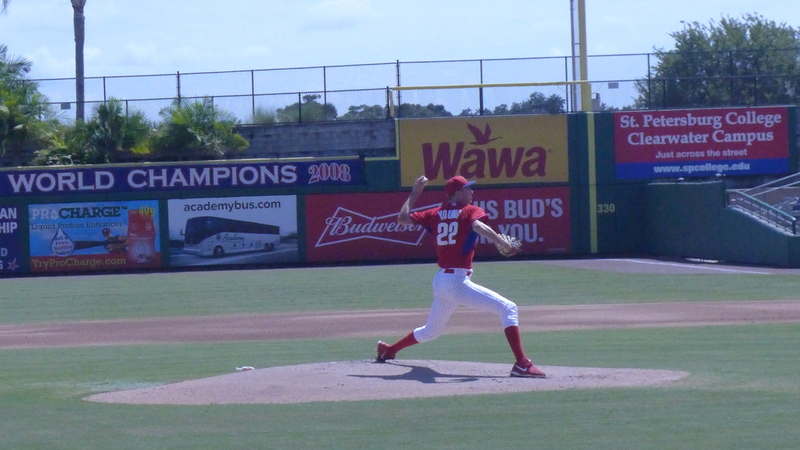 I continue to believe that Taveras and Arauz will be the only two pitchers who willl actually deliver for LWD. Reason? Their solid whip through the season. LWD bats will no carry the theam. MVP of the game was Grullon. Ironically, the most important at bat of the game, and turning point what his strikeout in his second at bat. It was an 11 pitch at bat with 8 foul balls. After that LWD bats got on fire. 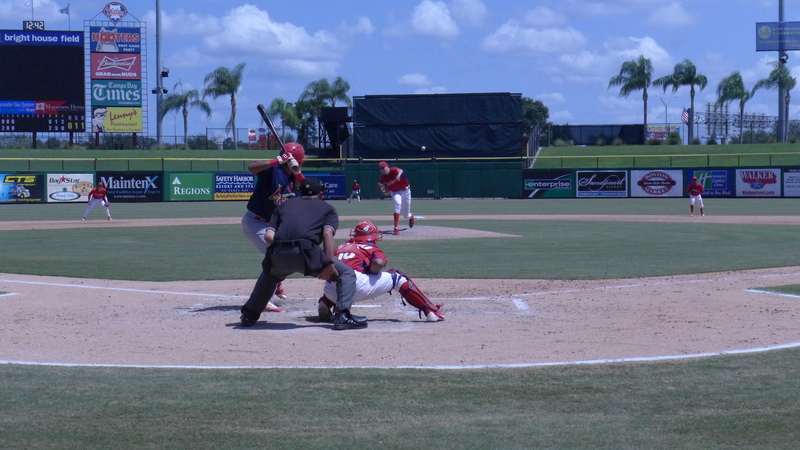 Taveras he does look like an up coming pitcher seems to have the control command too. 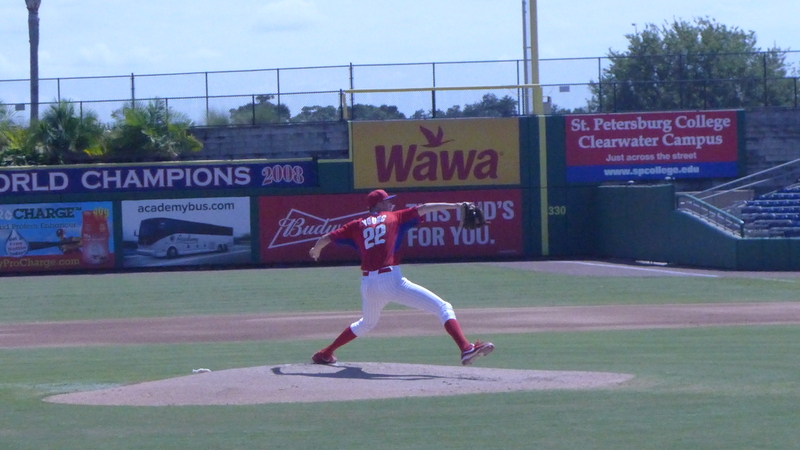 another good performance by Dyer; guess he’s a reliever in Clearwater next year? whats his upside? At one point last night Williams, Cozens, Hoskins, and Randolph all struck out with two men on base within a few minutes of each other. Playoff experience is so good for these kids. Let’s hope some of them bounce back. JP and Williams are in death slumps and just need their seasons to end. Lively really pitched well until the homer on pitch 105. It capped off a great season for him. was at game last night. Lively was awesome. Williams pathetic at plate but made 2 great plays, one which kept game at 0-0. we hit 4 balls that SWB CF caught with his back to infield at fence. Strange thing about Lively and Umpire. Had 8 swinging K’s some on horrendous off balance swings, Umpire was good to generous on strike 1 and 2 calls but did not call a strike 3 looking all night. Batter before HR was 1-2 and Lively broke a curve that everyone thought was strike 3. Then on 3-2 threw fastball down middle for ball 4. Lively clearly upset and wanted pitch. After HR when Lively left mound he and Ump had words and exchanged gestures. Unless SWB is most disciplined batters should have been a few called strike 3’s in game. …..is there a guy on this team that has more of the complete hit tool above the others? “Ability wise we’ve got several and we’ve mentioned almost all of them except Rhys Hoskins and Jorge Alfaro. As far as some guys who far as in game knowing about having a good feel for what they’re going to do to him and what he has to do back, I think Rhys Hoskins has done a tremendous job along those lines as far as being a cerebral hitter and knowing what’s going to happen to him and paying attention to pitching patterns and then making adjustments to what they’re going to do and being able to take the ball to the opposite field when they’re going to give that to him and then lay in the weeds and go up top when he’s ahead in the count and the game’s on the line. So, I think I wanted to make sure I give a little shout out to him, because he’s done the physical things and the routine and the whole bit, but also he’s really, really done a nice job, you know, learning how to play, how to be a hitter and like I said, the other guys– I don’t want to leave them behind– it’s not like they haven’t, but I think Hoskins has done a little more along those lines than some of the others”. Who do you think was 2016's top prospect Hitter of the Year? Even Franciso Mejia, Eloy Jimenez or Hoskins could have also been choices. But having Cozens up there is a good thing. Mike (NY): So who do you take J.P. Crawford or Amed Rosario and do you have a guy who could really rise in prospect ranks next year? ……..Jarrett Seidler: Crawford. I’ll be a homer and take Thomas Szapucki for the second part. I guess this begins the Thomas Szapucki portion of the chat. steaka (NYC): Got a guess on a JP Crawford ETA?………….Jarrett Seidler: Assuming the CBA doesn’t make major changes to service time, either late-April or June of next year. I suspect most teams would’ve had him up already, but wins don’t matter in 2016 to Philly’s front office. Romus, I appreciate that everyone is still high on JP. I am also. But there was nothing this year that said “I have to be promoted to the Majors!” He will benefit from more time at LHV in April and May. This does not have anything to do with service time or the 40 Man roster, just his development. I expect he will show in the beginning of next season that he is ready then. I think the Yankees prospects look better than the Phillies prospects. I’m hoping we’re not overvaluing our guys but these two likely series losses concern me.